On the Rocky steps, you can stand in the exact spot where the fictional Rocky Balboa raised his arms in triumph and exultation, at the apex of the steps of the Philadelphia Museum of Art. The Rocky steps - thanks to the wildly popular series of films made by actor Sylvester Stallone, a native Philadelphian - have become an iconic place to visit in Philadelphia, and entered the city's vast traditions and lore. These 72 steps comprise the entrance to the Philadelphia Museum of Art - a world-class cultural institution. 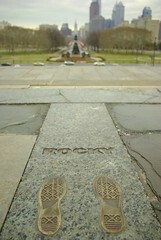 View of the Rocky steps from their base. This photo illustrates vividly how steep they are, and the exhilaration that you feel after sprinting up them. For greater appreciate of their steepness, just click directly on the photo to enlarge it. The purple Phlash trolley offers the quickest and easiest journey. The Phlash will literally take you to the door of the Philadelphia Museum of Art, for just $2. There are two downsides to the Phlash, unfortunately. One is that it only operates six months out of the year - from May 1 to Halloween. The other is that it doesn't run at night - in fact, it will begin shutting down at around 5:30 - 6 PM. Fortunately, SEPTA offers other options for getting to the Philadelphia Museum of Art, which run year-round and don't cease at 5:30 - 6 PM. If you are already in Center City, or coming from one of the nearby neighborhoods, you can take the Broad Street Subway / Orange Line to its City Hall Station, which drops you off at Broad and Market Streets. From there, you can connect with SEPTA bus service, which will take you directly up the Benjamin Franklin Parkway to the steps of the Museum of Art, which is located at 26th Street and the Ben Franklin Parkway. In the same way, you can take the Blue Line / Market-Frankford Line / "the el" - which are just different names for the same SEPTA line - to its 15th Street Station, where you will disembark at 15th and Market Streets. At that point, you pick up the SEPTA bus. However, if you are traveling from one of the outlying neighborhoods, or from the Philadelphia suburbs in either Pennsylvania or New Jersey, your best option is SEPTA Regional Rail service. Nearly every inbound SEPTA train will stop at Suburban Station - located at the intersection of 16th Street and John F. Kennedy Boulevard. Once you've disembarked, pick up the SEPTA bus, or the Phlash, if it's running; the Phlash has a stop at 15th and JFK, just one block away from Suburban Station. If the Phlash is operating, you're much better off with the purple trolley, than the SEPTA bus. Your Amtrak ticket is valid that day, to take you, via SEPTA Regional Rail, to either Suburban Station or Market East Station - which is located at 11th and Market Streets. After you get off your Amtrak train, follow signs for SEPTA Regional Rail - you won't even have to go outside. Once there, ask at the ticket window, if they can direct you to an eastbound Regional Rail train, that will stop at Suburban Station. This should only be a few minutes away, given the frequency of service. Check with the conductor before boarding, also - "Does this train go to Suburban Station?" You'll only be on the train for one stop - it's about a five minute ride to Suburban Station, so don't even bother to sit down. Once you're at Suburban, come up to street level and follow the directions above. You'd be a lot better off, just taking a cab from 30th Street Station to the Rocky steps. The cab ride won't be that expensive, and will be a lot faster than the methods described above. And you can easily get a cab at 30th Street, obviously. In fact, if you want to scale the Rocky steps quickly, and have your photo taken, you could probably even ask your cab driver to wait a couple of minutes at the Museum of Art, for you to do this, and then he can take you directly to your next destination. And if he wants a few extra dollars to do it, give it to him. It'll save you a lot of time and aggravation, time that you'd be better off spending enjoying your visit to Philadelphia, at other of the city's many tourist attractions and destinations. Just off the base of the steps, over to the right, you can see the famous Rocky Statue - the 8' 6" bronze statue, which was commissioned for Rocky III in the early 1980s. In the film, the statue is unveiled at the top of the Rocky steps. In reality, it was displayed outside the old Philadelphia Spectrum in South Philadelphia until late 2006, when the Museum of Art agreed to host the statue, as long as it was off to the side and not on the steps, themselves. 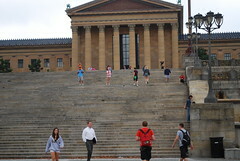 If you'd like to leave the Rocky Steps and return to the Philadelphia Museum of Art, please click here. If you'd like to return to the Home Page of Enjoying Philadelphia, please click here.